Germany is globally one of the most important markets for finished granite products. The country’s imports increased in 2017 but with lower price per tonne. 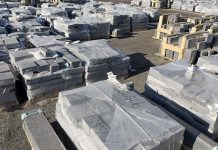 Stonenews.eu, after collecting and studying data from the International Trade Centre and the National Statistical Institutes, is presenting the growth of Germany’s finished granite imports between 2016 and 2017 as well as the shares in value and quantity in 2017. 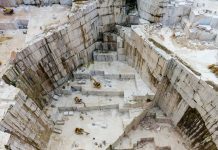 During the last decade, Germany’s finished granite products imports have had various fluctuations in value, quantity and price per tonne. It is worth saying that from 2007 to 2017, the import value decreased by -28.5%, the quantity by -13.8% and price per tonne by -17.1%. However, between 2016 and 2017 there has been an increase in import value by +0.99% and in quantity by +5.11%. As for price per tonne, the statistical reports show that Germany imports finished granite products in lower price. More specifically, from 2013 to 2017, price per tonne decreased by -8.5% while between 2016 and 2017 it went down by -3.92%. 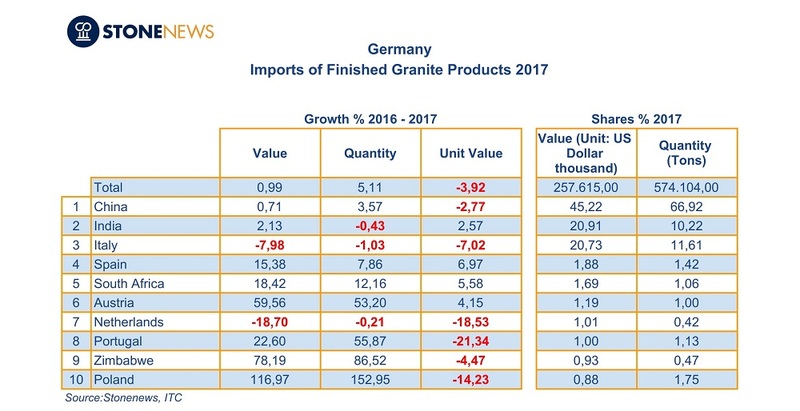 The table below shows in brief the top ten countries that exported finished granite products to Germany in 2017, according to import value. As shown at the table, in 2017, Germany imported finished granite products in higher price per tonne, compared to 2016, from Spain by +6.97%, from South Africa by +5.58%, from Austria by +4.15% and from India by +2.57%. On the contrary, imports with lower price per tonne came from Portugal by -21.34%, from The Netherlands by -18,53%, from Poland by -14,23%, from Italy by -7,02%, from Zimbabwe by -4.47% and fromm China by -2.77%. 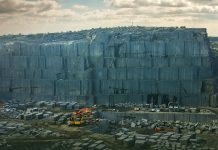 In 2017, Germany imported finished granite products from 47 countries. 91.8% of the total import value was under HS Code 680293* and the rest 8.2% under code 680223*.